Today I added another upgrade into my "Red Hive" PC project, bought two 2tb Samsung HD204UI 5400rpm Spinpoint Hard Drives from my friend. Not brand new, but in very good condition. I didn't really need that much space, but it never goes to waste either. Before i had 320gb and 300gb HDDs, 300gb HDD was for games and it has only 7gb free, not too much lol. Both of the Samsung HD204UIs are 25-26C, both are in front of a case fan, so they stay quite cool. 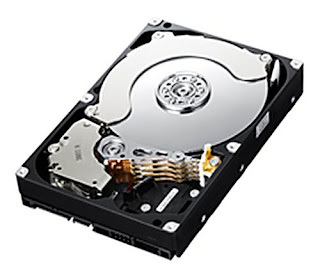 My external 3tb HDD is at 37C, but considering that it is 7200rpm (faster) and it is external without any fans being right next to it + its in a plastic case, it is normal, but the cooler the better. It does not matter if those HDDs have load on them or not, temps seem to remain same. As mentioned before, write speed is about 132mb/s and read is 135mb/s, which is quite good for 5400rpm HDD. It might be too slow to record games @ 60fps in 1920x1080, but not sure, either way i never record at 60fps because file sizes are too huge and 30fps recordings are more than enough for youtube, they are smooth and nice. most movies are 23.5fps - 25fps and movies don't have visual lag, so im good with that and on top of that, i use 3tb External HDD for recordings, which is 7200rpm and can read/write at 220mb/s. Nothing special, looks like any other HDD from top. They should really make a design where you have cover under the HDD. 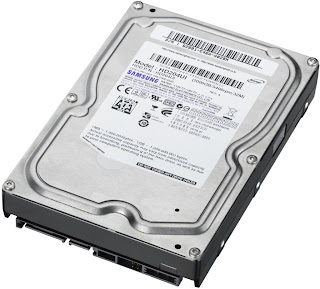 Here is view of opened Samsung HDD, well 90% of HDDs look the same inside. On the left bottom corner you see the super powerful magnet, that is used to write onto the Disk itself thru the magnetic arms, which you find below the disk, right from the magnet. And top middle, you find the disk itself with a small cover, not sure what the purpose of this cover it, maybe for better balance. NOTE - you should NEVER open your HDD and turn it on, HDDs must be closed when working, most HDDs need certain pressure inside for the magnetic arms to "float" over the disk surface. if that pressure is broken, you will end up damaging the disk permanently. This is one of the best thermal pastes / compounds out there, I am no expert on thermal pastes, in fact this is first time i ever compare them, but i do know few things about them based on reviews and other people's tests, that if you want to take most of your CPU cooler, such as Corsair H100 (it's what i have), then you need performance thermal compound and not some crappy default one. What actually came to me as surprise, is that Corsair H100 came with default thermal paste applied to the H100 cooler and this is what i used to mount it with, i took it out of box and into PC it went. 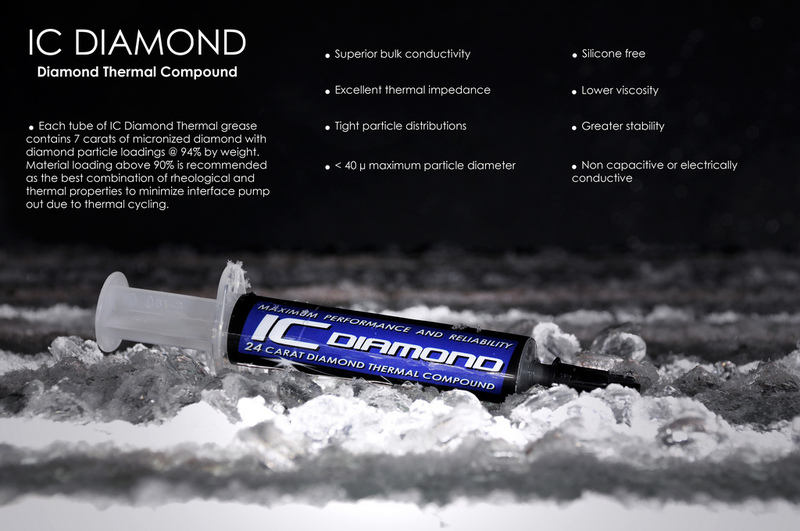 ..but now that i cleaned that default thermal paste off and applied this IC Diamond, my temps are quite surprising. I have not tested it under load yet, but i will make some tests and probably update the post. How should i apply the thermal paste? It is indeed confusing, because all the default CPU coolers have pre-applied thermal compound and it is spread out as a very thin layer, about the size of the CPU's top, well this is bad way. If you want best cooling, never use the default thermal paste that comes with the cooler (do not use default cooler either). 1. Apply a drop in the middle of the CPU (not onto the cooler). 4. While holding CPU cooler down, tighten the brackets (but not too tight, just enough so cooler does not lift off when you take hand off) and make sure that in process, you do not lift the cooler at all, if you lift the cooler, you should start all over again by wiping off the thermal paste again. 6. Finally tighten all screws / brackets, you can tighten them quite hard, but make sure you do not break anything, you should have a "feel" for the material, you should be able to feel when metal / plastic starts to break and don't go too far with it. on H100, you can't over do them, because screws simply touch the bracket and then you can't go any further. First of, not as easy as you think it is. I have seen rookies/noobs break their CPU when removing the cooler, it is not as easy as you think. I have Asus Silent Knight II CPU cooler in other PC, which has a custom AMD bracket and with that, you don't have this problem, you can simply undo the bracket and pull off the cooler, however with 90% of CPU coolers, you can't do that. Why? because thermal compound acts as a glue, it stucks to the CPU/Cooler, so if you undo the bracket / screws and pull the cooler off, you end up ripping your CPU out of the socket and most likely it ends up by bending some of the CPU pins .. and in most cases it damages the CPU and in bad case, some pins may even break off, because CPU cannot be pulled out of socket, you must first unlock it by pulling the lever up, but it is under the cooler, so you can't do that before removing cooler. See the problem? Solution is quite easy actually, put some pressure on your heatsink / cooler and then undo the screws / brackets that hold the CPU cooler (do not let go of the cpu cooler, keep pressure on). once CPU cooler is loose, only thing holding it down is pressure from your hand, then start twisting the cpu cooler from side to side, until you feel its quite loose, then move it from side to side, when you're sure it is no longer stuck to your CPU, remove it. With H100 or some other liquid coolers, it maybe more complex, because on my H100 those hoses/pipes for liquid have plastic cover, which is extremely hard to bend, meaning that once cooler have been mounted for months, those hoses take the shape they are in, meaning that if you try to remove the cooler, they actually pull back or they may still push the CPU cooler other way, so you must be very careful in such cases when undoing the brackets/screws, because those hoses have enough pressure to rip the whole CPU out of the socket if you're not holding the cooler down.